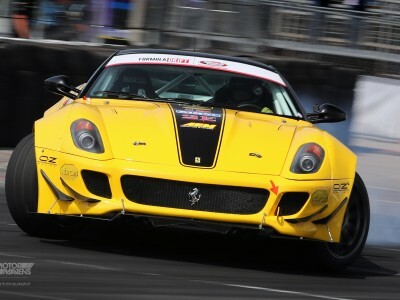 This weekend, Formula Drift brings the third round of the championship series to an all new venue, Palm Beach International Raceway in Jupiter, Florida. I managed to shoot a few photos while filming random shenanigans around the track. I really liked the high speed entry to this new track, flowing into a long transition on a rumble strip. 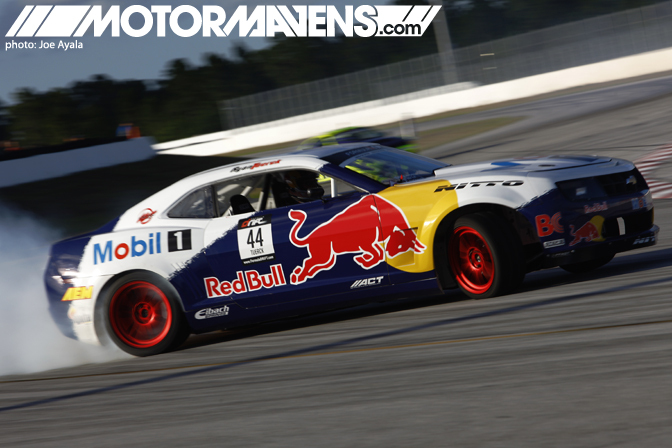 Formerly known as Moroso Raceway, the high speed capability of PBIR’s road course did present a problem, however – the course layout led a lot of high speed drifting right into the fans laps. 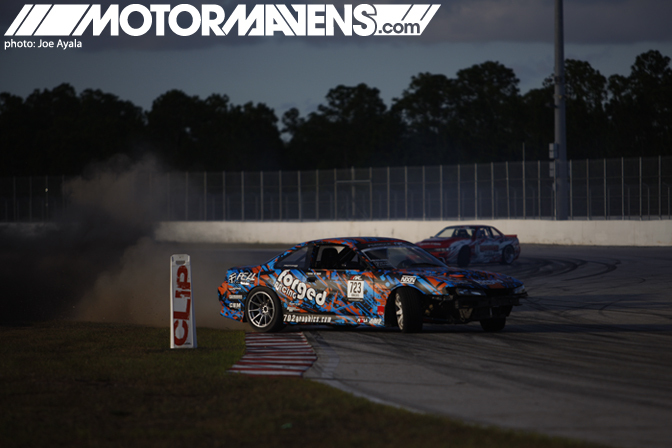 Since this was the very first time that the Formula Drift series would be running at Palm Beach, they certainly didn’t expect these types of results from their initial course layout! 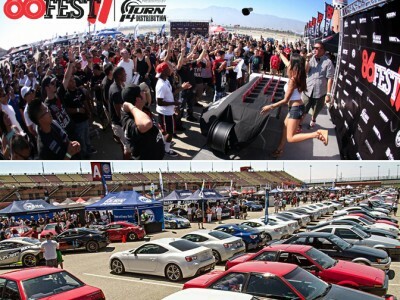 However, since Formula D is a responsible professional organization, they decided to reverse the course layout mid day in the interest of driver safety. 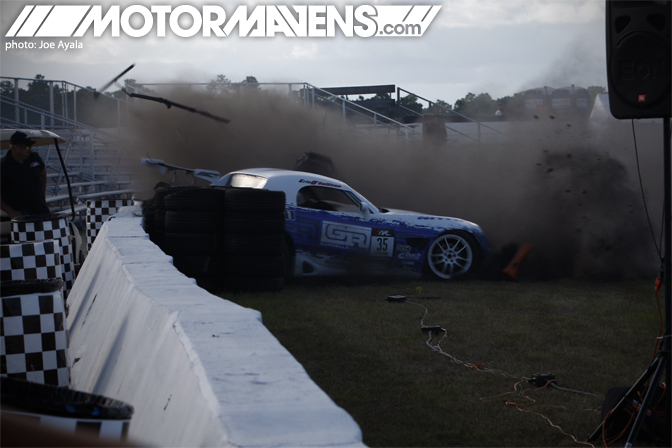 Fortunately, in an incident where Irish ProDrift star Eric O’Sullivan backed the Gardella Racing Solstice into the wall due to a high speed entry (on the first course layout), nobody got hurt. Whew! 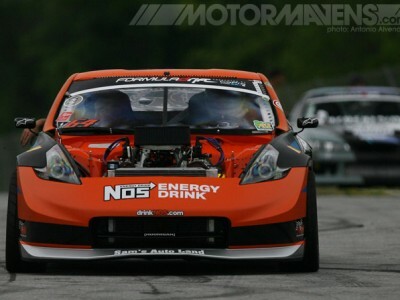 However, if you can make it past the treacherous, high speed section of the track in a big V8 Chevy Camaro like Ryan Tuerck can, you can make some seriously awesome circle burners. For the safety of the drivers and spectators, a last minute decision to change the track layout was made. 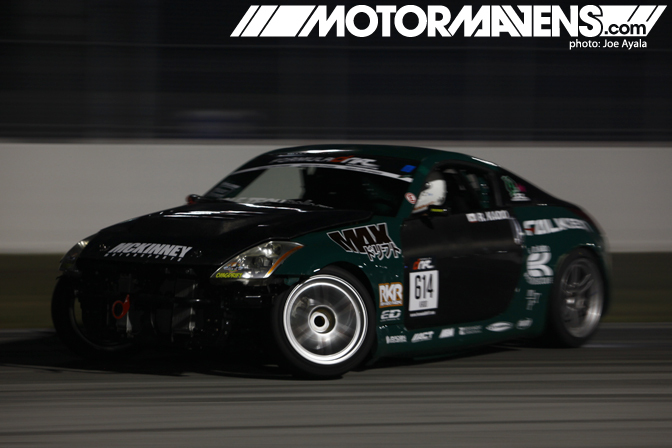 Here is a photo of Northern Californian Z33 350Z driver and generous host of the Tandem of Die video, Ryan Kado. Needless to say, we’re all pretty excited to see how this weekend’s results will turn out, so we can’t wait to get back to the track… but it’s almost 7am now, and I need to get some sleep before qualifying starts. Stay up for more coverage! I’m waiting for pictures of alligators! CMON! Hi, Joe. I like your photos. Nice shots Joe! How bad is the Gardella solstice? so where is the link to this vid of die ryan gave up ? im still scraching my head. and thanks for the sick photos! No one got hurt, but I think Dan Cyr might have gotten hit by a side mirror. Was it a mirror or a tail light? I couldn’t really tell….and then a bunch of dudes came outta nowhere and scooped all the stuff up and disappeared. Loved your airport video Joe!